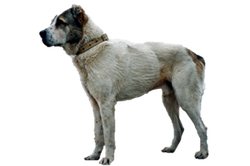 The term ‘ovtchrka’ (also seen as ‘owtscharka’ or ‘ovcharka’) indicates a shepherd’s guard dog rather than one used for herding sheep. Primarily they protect the flock from predators, such as wolves, and thieves. Even today this breed is mainly kept as a working animal. The homeland of the Central Asian Ovtcharka stretches from central Russia into Siberia and Mongolia. With such a large range it is inevitable that unintentional cross breeding has occurred. It is said that the purest specimens are found in the remote regions of Tadzhikistan, Uzbekistan and Kazakhstan. An ancient breed, it is believed by most to have descended from the Tibetan Mastiff, although some Russian authors dispute this, insisting that it is the Central Asian that is the older of the two. Is the Central Asian Ovcharka Right for You?